NECA-IBEW Electricians provides world-class services through a highly trained union workforce in the Youngstown-Warren area. 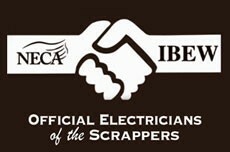 We’re a partnership of local units of the National Electrical Contractors Association and the International Brotherhood of Electrical Workers. Take the first step on your way to a rewarding career in the electrical trades by applying for a union electrician apprenticeship. Earn while you learn. Our 3- and 5-year programs can set you up for many different careers in the electrical industry. View videos of current and past apprentices here.